About the song: These are just three of many verses in this beautiful Russian folksong. In a minor key, the song is unusual for having three-bar phrases (rather than two-bar or four-bar phrases). The song may be sung as a 3-part canon, each voice entering one beat after the previous voice. The text speaks of a birch tree, cut down so that its wood may be used to make a balalaika. The Birch Tree has an important place in orchestral music, since the Russian composer Tchaikowsky used the song as one of the melodies in the Finale of his Symphony No 4. (It can be heard shortly after the opening.) Children love this colourful symphony, and an exercise for the children is to listen to the Finale and identify when they hear The Birch Tree. Children will also love other works of Tchaikowsky, and a great place to start is his music for The Nutcracker. 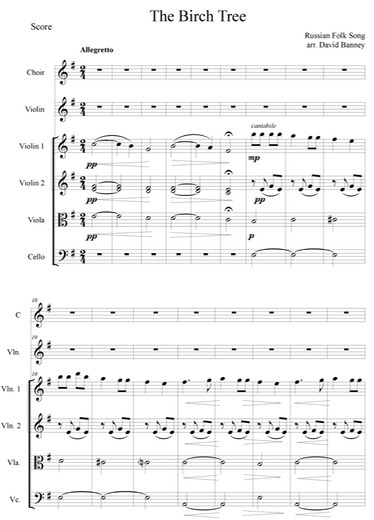 About the arrangement: The arrangement aims to capture the wistful mood of the melody, and includes a canon between the solo violin and the choir in the second verse.